John Zuccotti, former NYC Deputy Mayor. John E[ugene] Zuccotti was former Deputy Mayor of New York City and subsequently Chairman of Brookfield Properties. Zuccotti Park was named in his honor. He was born in Greenwich Village on June 23, 1937 to Angelo and Gemma Zuccotti. Angelo Zuccotti was an Italian immigrant to the United States who became well known in New York City as the longtime maitre d' of El Morocco. Angelo died in 1998. John Zuccotti attended St. Joseph's Academy on Washington Square Park and LaSalle Military Academy in Oakdale, Long Island. He graduated in 1959 from Princeton University with a bachelor's degree. 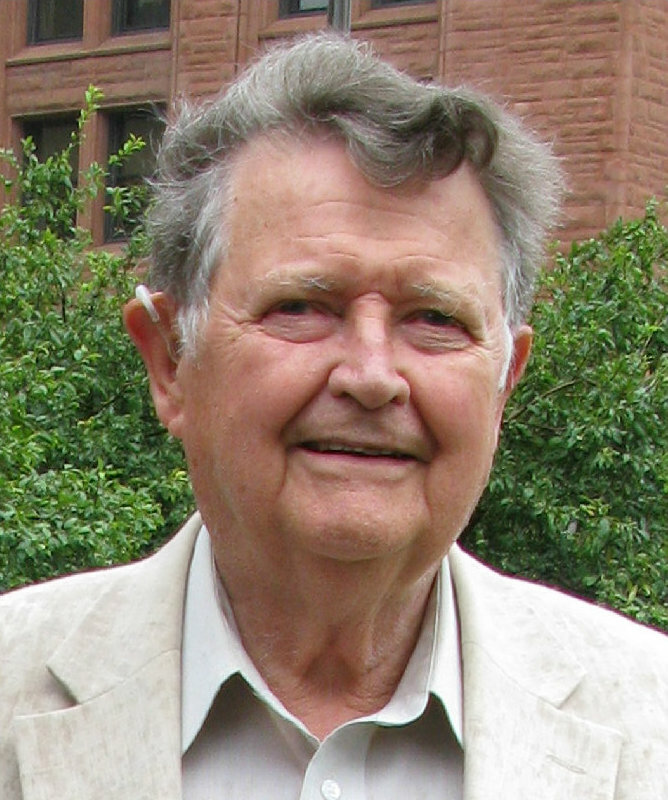 He served as an officer inn the U.S. Army and then earned a JD degree from Yale Law School in 1962. He met his wife Susan Sessions during a summer internship at the office of Sen. Jacob Javits; they were married in 1963. He started his career as an urban consultant in Venezuela, then worked as assistant to the secretary of the Department of Housing and Urban Development in Washington. During the administration of Mayor John Lindsay he was a commissioner of the New York City Planning Commission and became its Chairman. In 1975 he served as First Deputy Mayor under Mayor Abraham Beame. In 1978 he became a founding member of Tufo, Johnston & Zuccotti, partnering with Peter Tufo, who had been a fellow student at Yale Law School and then a colleague in the Lindsay Administration. Their firm was merged with a larger firm to form Brown & Wood in 1983. Zuccotti has also worked as Senior Counsel with Weil, Gotshal & Manges. 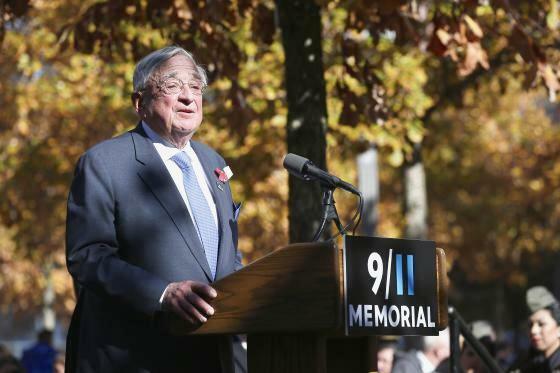 He served as chairman of the Real Estate Board of New York, and as a member of the board of the World Trade Center Memorial Foundation and of the Visiting Nurse Service of New York. Zuccotti was active in both Democratic and Republican politics on both the local and national level, serving at various times on the National Republican Congressional Committee and Joe Biden's presidential campaign. After leaving political office he became a partner in Olympia & York, and was the U.S. chairman of Brookfield Properties and then Chairman of Global Operations at the time of his death. He was a keen consumer of movies and liked to frequent Chelsea's Alan's Alley, which Alan Sklar operated at 23rd Street and Ninth Avenue for a quarter century until 2014, offering a huge collection of rare and foreign movies for rent and sale. Zuccotti died of a heart attack on November 19, 2015, aged 78. He is survived by his wife Susan Sessions Zuccotti, their three children and their spouses – Gianna and David Weinstock; Andrew and Margaret Mauran; and Milena and Jason Merwin – and eight grandchildren: Sophie, Noa and Lia Weinstock; Nicholas, Emma and Robert Zuccotti; and Cassie and Lily Merwin. He is also survived by his brother Andrew, a lawyer in Seattle, and his wife Trish and their children. Susan Zuccotti is the author of several award-winning books on the Holocaust – those who resisted, those who looked away, and those who collaborated – and its survivors. The family will be celebrating John Zuccotti's life at a memorial service on Monday, Dec. 7, at 10:30 am at the David Geffen Hall (formerly Avery Fisher Hall) at Lincoln Center in New York City. A reception will follow at the same hall. In lieu of flowers, the family has asked that contributions be made to the New York Methodist Hospital in Brooklyn, N.Y., the New York Blood Center, or the Group for the East End/Accabonac Protection Committee in Bridgehampton, N.Y.
Before there were simpler devices for showing movies at home, John Zuccotti used to set up a movie projector and bring home reels of movies in metal cans, with breaks for reloading the way we old-timers remember it was done when we first watched movies. Alice and I and our children were beneficiaries of this Saturday night custom, as we became regulars. His secretary, also a movie buff, would suggest movies and we saw some great ones. The movie nights were a beautiful experience for our children, curled up in sleeping bags or quilts in front. We all loved them. We even had the cartoons first. The classic movies brought good old-fashioned moral lessons and fun for the children. 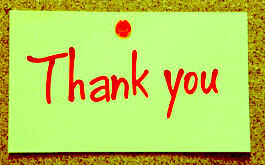 We are grateful for being included. John was a true family man. He did the father and grandfather thing right – taking youngsters out fishing and for walks in the neighborhood. No one was more attuned to the times we lived in. He lived life to the brim. I think his success in life came not just from his legal and communication skills but from his decency. He was trusted because he was fair. have to settle for worse wine... or move to another state. I mean, what's really important to you? The New York State Liquor Authority (SLA) has sent out an Advisory that will change the state beverage law. It would change how wine lists in top restaurants are written in the state. It would destroy the reputation that NY State enjoys as having the best wine lists in restaurants. More on this story here. The NYS SLA wants comments within a few weeks. on 9/11, but Economic Losses May Be Greater Relative to Size. November 16, 2015–As the chief economist for two different New York City Comptrollers in 1993 and 2001, I was required to prepare official numbers for the economic loss to New York City of both of the terrorist attacks on the World Trade Center. A colleague has asked me – "How do the economic losses from the Paris attacks compare with the New York City numbers for 9/11?" NYC, 2001. Business leaders in New York City were fearful after both attacks. In 1993 it had been comforting that the attack could be dismissed as "the gang that couldn't shoot straight" because the explosives did relatively little damage to the World Trade Center (one post protected the next) and the driver of the rented truck used in the bombing tried to get back his deposit! He was of course quickly apprehended. In 2001, it was 100 times worse. The cost of higher insurance premiums and deductibles in 2001, the cost of installing new security protections in offices and residences all over New York City and alternative sites in suburban areas, was far greater. That doesn't take into account the national response of launching a military attack on Iraq. The first official estimate in 2001 of the economic loss to New York City of 9/11 was made within two weeks. It was in a range of $95 to $105 billion, approximately 100 times the economic impact of the 1993 attack. The first estimate was made when the loss of life from the World Trade Center alone was believed to be close to 6,000 people. The approach was to estimate the one-time loss of buildings, property and lifetime earnings of people who were killed, and then to add to this the present value of adverse business-location decisions. As more survivors were identified, the estimate of the number of dead was lowered from 6,000 to 3,000 (including deaths from the Pentagon attack and all four crashed planes). Early on, the fear was that many businesses would relocate to New Jersey and Westchester County. In fact, many large companies acquired alternative office space in these areas. But few moved out. With the election as Mayor in November of a successful member of their own fraternity – Michael Bloomberg – business leaders believed that their fears would be addressed fully and competently. 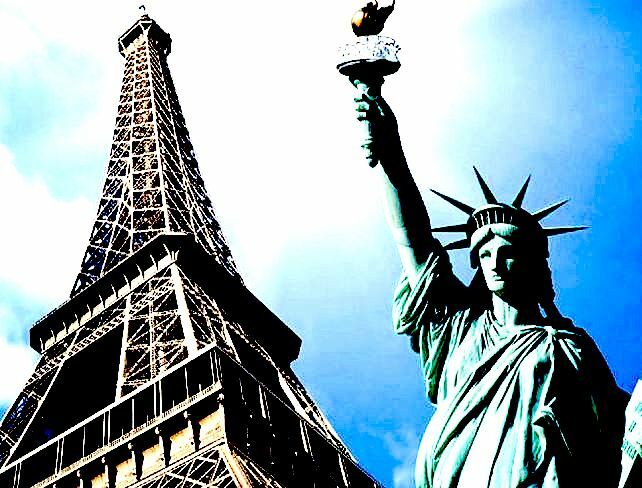 France is more dependent on Paris than the United States is on New York City. The NYC metro area accounts for 8 percent of U.S. gross product, whereas Paris accounts for one-fourth of French gross product. 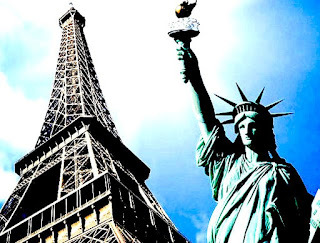 France is much more dependent on tourist revenue than the United States, and Paris is the main gateway. The $17 trillion U.S. economy has well-monitored borders with Mexico and Canada and has invested heavily in Homeland Security. The less-than-$3 trillion French economy must cope with borders – in places porous – with Belgium, Luxembourg, Germany, Switzerland, Italy and Spain, not to mention the high volume of traffic to and from Britain. France has reportedly suspended its commitment to the Schengen Agreement on open borders, which will entail new costs. On the other hand, the regional and national alternatives to NYC for large American businesses are greater than for businesses in Paris that wish to remain in a francophone environment. It would probably be harder to pull up stakes from Paris and move to a suburban location or another French city because Paris uniquely dominates France, as London dominates Britain. Based on these considerations, the Paris of the Hebdo and November terrorist attacks could add up to an economic loss for Paris less than but approaching the percentage estimated for the 9/11 attacks. The 8 percent figure applied to the metropolitan Paris economy would come to nearly $6 billion. The USA and France. The attack imposed large costs on the Federal Government – on the Federal Reserve System to fund the liquidity crisis immediately after the attack as well as a $20 billion commitment of grants and loans by the Federal Government to compensate New York City for losses in what was properly considered an act of war. An interesting 2010 article in the journal Peace Economy, Peace Science and Public Policy by USC and Claremont economic professors Adam Z. Rose and S. Brock Blomberg, “Total Economic Consequences of Terrorist Attacks: Insights from 9/11”, concludes that the initial economic loss to the USA from 9/11 was at least $75 billion, or three-quarters of a percent of GDP. This is not necessarily inconsistent with the New York City number because migrations of businesses out of New York City within the United States would not be a loss to the United States, so the national number could well be smaller than the local number at the center of the attack. [W]e, rather than the perpetrators, are the major determinant of the consequences of a major terrorist attack. After 9/11, our resilience was high, but so was our fear [... ]. [S]ubsequent anti-terrorist initiatives at home and abroad were more costly than the direct damage caused by the attack. The United States has invested $650 billion since 2001 in Homeland Security. The French commitment before the latest attack was a little more than one-thousandth of that. France will have to spend more, and the United States needs to assist. American concern about terrorism is greater now than it was after the Boston Marathon attack. 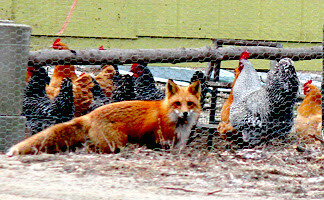 Glass-Steagall kept speculative foxes out of the commercial-bank henhouse. Myth #1: Glass-Steagall is too complex for ordinary voters to understand. An investment banker says: "If one percent of people actually know what Glass-Steagall did and what it would do now, it’s not more than that.” He says the Glass-Steagall issue will not change anyone's vote. Fact: The law was simple – that's why it worked fine for half a century. It traded federal deposit insurance for risk-limiting bank regs. People know the 2007-2009 crisis came from deregulation. The Glass-Steagall Act (i.e., the Banking Act) of 1933 had two main parts. House Banking Chairman Rep. Henry Steagall, Democrat of Alabama, was carrying water for the banks, which wanted deposit insurance. They got deposit insurance up to $2,500 (soon raised to $5,000) per account. Not complicated is that the half of the Banking Act of 1933 that the banks liked – deposit insurance – is still with us. The limit to coverage of deposit insurance has steadily increased 100-fold, from the original $2,500 per depositor to $250,000 per deposit account. Depositors are allowed to have more than one covered account (sole, joint, custodian etc.). Beyond that, the FDIC for valid efficiency reasons avoids the costly litigation involved in liquidating a bank and instead negotiates takeover over its assets and liabilities by a solvent bank. This in effect means 100 percent coverage of deposits. FDR and Treasury Secretary Woodin were initially opposed to this giveaway to the banks. They were only induced to support Federal assumption of banking risks in return for bank regulations imposed in Sen. Carter Glass's bill, which was designed to protect the Federal Reserve System he helped create in 1913. Myth #2: Glass-Steagall was eliminated in 1999. Fact: Only half of Glass-Steagall was gutted, the Glass part. The Glass-Steagall law was simple. What was complicated was the piecemeal and devious dismantling by its opponents of the Glass component of the law, in the name of "modernization". The deregulatory moves culminating in the 1999 Gramm-Leach-Bliley Act kept the Federal deposit insurance and took down the wall between insured banking and speculative issuance of securities. Former Federal Reserve Chairman Alan Greenspan said in October 2008: “Those of us who have looked to the self-interest of lending institutions to protect shareholders’ equity, myself included, are in a state of shocked disbelief.” Nothing too complicated about this story. Myth #3: Glass-Steagall was about the big banks. Hillary Clinton: "[In my proposed bill] I go after all of Wall Street, not just the big banks"
Fact: Glass-Steagall was not just about the big banks. It was about all FDIC-insured banks. It was about protecting the henhouse assets of all insured banks from foxes selling speculative securities. Glass-Steagall was about putting a wall between the humdrum business of taking deposits from consumers and making loans back to them (the henhouse), and the risky business of speculating in business equity and debt (the foxes, or wolves). John Reed, former Chairman of Citigroup, wrote last week in the Financial Times that he has come to the view that the wall between banks and investment banks was a good one. "As is now clear, traditional banking attracts one kind of talent, which is entirely different from the kinds drawn towards investment banking and trading. Traditional bankers tend to be extroverts, sociable people who are focused on longer term relationships. They are, in many important respects, risk averse. Investment bankers and their traders are more short termist. They are comfortable with, and many even seek out, risk and are more focused on immediate reward. In addition, investment banking organisations tend to organise and focus on products rather than customers. This creates fundamental differences in values." James Bullard, President of the St. 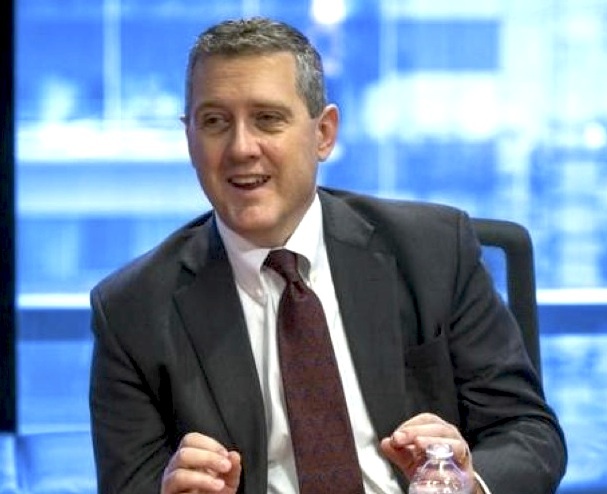 The President of the St. Louis Fed, James Bullard, is in line to join Jeffrey Lacker of the Richmond Fed in calling for an increase in the fed funds rate. The St. Louis Fed has historically been the champion of the monetarist school, which keeps reminding Keynesians and New Keynesians who want to keep stimulating the economy that increasing the money supply will cause inflation. At one time, zero-lower-bound interest rates were viewed as dangerously inflationary. The fact that inflation has remained low hasn't changed the tune of a hawk like Jeffrey Lacker of the Federal Reserve Bank of Richmond. Six years ago he predicted that the zero-lower-bound approach taken in 2008 would make inflation soar. Now he's been voting for a rate increase at the most recent meetings of the FOMC, warning that inflation will get out of control if the FOMC doesn't raise rates. However, yesterday Bullard gave some support to the idea that the long period of low interest rates – the "Permazero" – might require a rethinking of monetary policy. At a Cato conference he said that after seven years, expectations for permanently low interest rates might be baked into the cake. Bullard says we should pay attention to the ideas of John Cochrane of Chicago's Booth School of Business, who suggests that raising the interest rate target off the zero-lower-bound floor may raise, not lower, inflation. The 94-page paper in which Cochrane lays out his theory and data poses the theory as a question – Do Higher Interest Rates Raise or Lower Inflation? Cochrane provides charts showing what happens to inflation under different assumptions. If you disagree with his story, I can hear him say, show me your model. I note that Cochrane relies on the simple version of the Irving Fisher's equation, using an expected inflation rate added to "real" rate. Most theories contain the Fisher relation that the nominal interest rate equals the real rate plus expected inflation, it = rt +Etπt+1, so they contain a steady state in which higher interest rates correspond to higher inflation. This is a simplification of the actual equation, which is multiplicative (rt * Etπt+1). The distinction doesn't doesn't matter for low levels of expected inflation (the "Fisher premium"), but it certainly does for higher ones – far as that may be from our recent inflation numbers. Bullard does not take the step of opposing a rate increase based on Cochrane's theories. That would put him in the same boat as Paul Krugman, who opposes a rate increase on Keynesian grounds that we still need more demand and higher rates could choke off demand. After seven years of Zero Interest Rate Policy, the FOMC is getting cabin fever. They are generals who look like they are avoiding a battle. Bullard made clear that his predisposition in December is to vote to raise rates. The FOMC may in December want to give the benefit of any doubt to a rise in rates. Cochrane has therefore done everyone a favor by providing a reason for inflation hawks to think a little harder... because raising rates just might be inflationary. The CityEconomist blog has clicked past 210K page views. During the past month, the ten most-viewed posts are shown in the table below. FOMC - Will Fed Hawks Say Boo Next Week? never loved it as much as the Dutch. 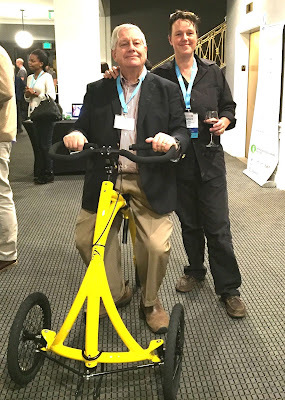 I am at the Social Venture Network conference in Baltimore and there is a new invention on display here, the Alinker™. I have tried it out and it works. 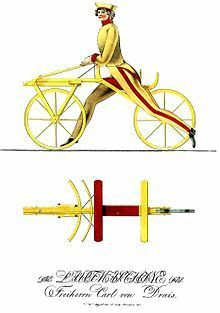 It looks a lot like the very first bicycle, invented nearly 200 years ago. It's being positioned as a medical device–a replacement for the wheelchair. It is useful for people who can still walk but need assistance because their legs are weak. It provides mobility while not reducing the patient to total dependence. It provides mobility but doesn't end exercise. Hobby horse with morris dancers. First, it keeps its users more active than a wheelchair. Second, it allows the users to socialize more easily because they are upright. Third, it is simpler than a motorized wheelchair and promises to be much cheaper, which matters a lot when we look down the road at looming medical costs for elderly people. 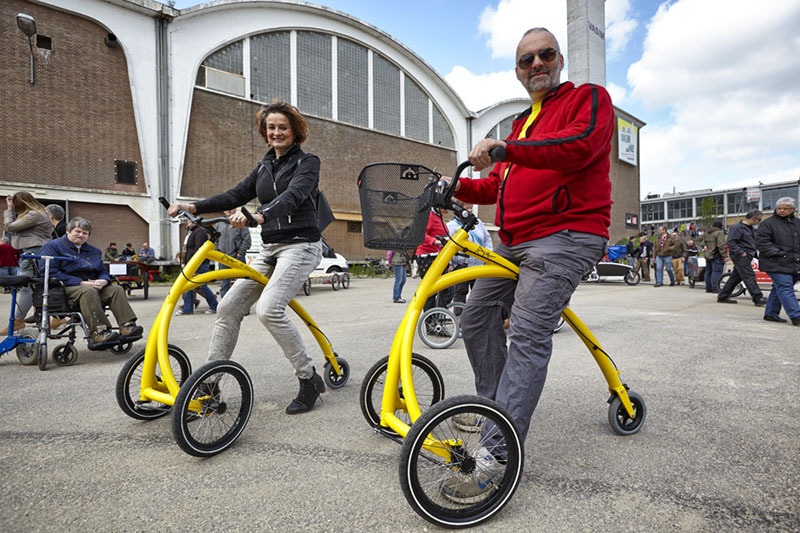 The new invention even shares the yellow color of the original walking cycle. I confess to a bias in favor of bicycles. I've been writing about them frequently over the years–for example, here. They are so darned efficient. Their concept is so simple. The original bicycle was a running cycle, with no pedals or chains or even brakes. Without pedals, the cycle doesn't go fast enough on level ground to need brakes–you stop the same way you stop running. 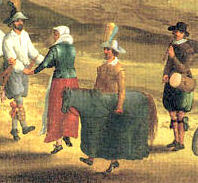 The early name for the running cycles was a "hobby horse", such as were used by morris dancers (see drawing) in England. My Dutch relatives were pioneers in use of the bicycle in that country. The major innovation in the 19th century was the addition of pedals. 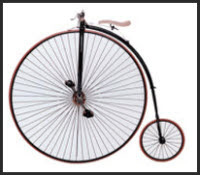 After some experimentation, the penny-farthing bicycle became the most popular shape. My great-grandfather Charles Boissevain is said to be the first person to bring a penny-farthing to Holland, a country that quickly cottoned on to it. Germany, which was the origin of the first bicycle, never became a great user of it in the 1920s when it became the rage in Holland. Perhaps it was because the German landscape is more mountainous than Holland's. Germany was also deeply disoriented by the onerous reparations of the Versailles treaty at the beginning of the decade and the Crash of 1929 at its end and had no disposal income to spend on new ideas. The hard wheels made a "bone-shaker" of a ride. The potential for the bicycle to get up some speed without a corresponding brake made it dangerous. A chain to shift the force from the pedal to the back wheel and allowing the pedal to be located between the two wheels, which made the bicycle much safer. Gears to control the revolutions of the pedal that were required per distance traveled. Rubber wheels and inner tubes filled with air, providing a smooth ride. A brake, either a back-pedaling mechanism or (better) calipers on the handles. During World War II when gasoline was scarce, the bicycle was a transportation godsend for the Dutch people. The tricycle has in recent decades been rediscovered in communities with many elderly people, where it can be used for recreation when a bicycle is too arduous, or for travel over short distances – to do shopping, walk a dog or meet with friends. Conference in Baltimore. Photo by Alice Tepper Marlin. It uses the tricycle approach for the elderly as has been rediscovered in Florida, with two wheels in front. It uses pneumatic tubes on the wheels for a smoother ride. It is shaped more like the later 19th century penny-farthing cycles, with the larger wheels in front for maneuverability. The small turning radius is equivalent to that of a wheelchair, so that it can be used indoors. The most interesting feature of the Alinker™ is that it can be used indoors like a wheelchair. Its simplicity means that once in full production the price can be brought down and it could compete on price as well as function with the wheelchair in cases where people need support but have use of their legs for propulsion. Right now the price is $2,000. For further information go to www.thealinker.com, or email info@thealinker.com. Joe Bain, volunteer class agent, Harvard College Class of 1945, sent an email to economics professor Mason Gaffney. Class agents collect news from alumni and help with "friend-raising" and fundraising. Social Security Actuarial Tables (2011) indicate that a 92-year-old man has a life expectancy of 3.4 years and that out of 184 surviving '45ers, only 11 will reach 100. So the actuaries say 11 of us will reach 100, eh? Well "I want to be in that number, when the cents go marching in", and I will be. I expect there will more than 10 more of you, too. There are no shortcuts in this race, though, so keep your sense of humor and leave 'em laughing when we go! 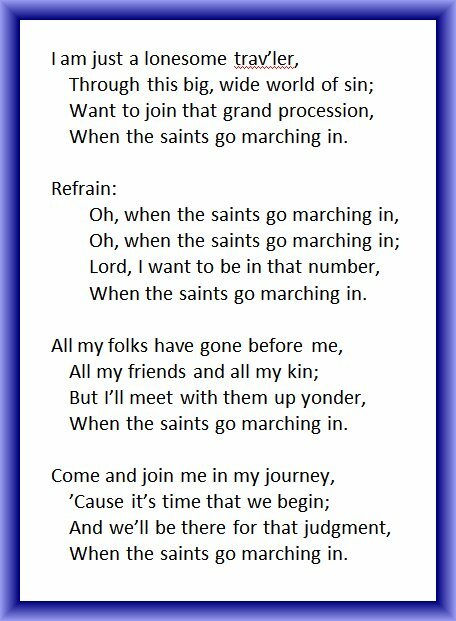 “When the Saints Go Marching In” was popularized by Louis Armstrong who first recorded it on May 13, 1938, and [...] and some 40 times since then. [...] Armstrong had grown up knowing the gospel tune, played somberly for funerals by the marching bands that accompanied the mourners to the graveyard and played joyously on their return. Armstrong’s lively recording of the tune [...] transformed it into the jazz standard we know today, closely associated with New Orleans’ Dixieland bands and performed by musicians of every style. So well known is the song that it is commonly referred to as “The Saints.” [...] In 1951 the Weavers (Pete Seeger, Lee Hays, Ronnie Gilbert, and Fred Hellerman) recorded it with Leo Diamond and His Orchestra. [...] Throughout the years Armstrong constantly changed his performance of “The Saints,” and he is captured on film at the 1958 Newport Jazz Festival (Jazz on a Summer’s Day) and with Danny Kaye in the 1958 film The Five Pennies. 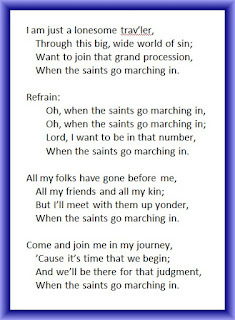 New Orleans is now famous worldwide as the city of jazz and the marching song, “When the Saints Go Marching In”. FOMC | Jobs Soar, Rate Hike Likely, But *100%*? The BLS reported this morning that nonfarm payrolls rose 271,000 in October, with a slight drop in unemployment to 5 percent. 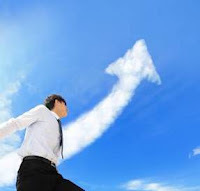 The payroll-job increase was well above the 185,000 increase forecast by economists who do that kind of thing (a foolhardy activity, since a forecast on Thursday will definitely be proven wrong on Friday). Caution: There will be another jobs report in early December before the FOMC meets in mid-December. But Bill Gross says there is a "100% chance" that the FOMC raises rates in December, regardless of the December jobs report. 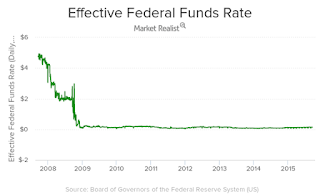 The October increase is exceeds the 137,000 increase in September and a similar number in August, and paves the way for a December increase in the federal funds rate, which would be the first such move since the zero-bound level set in December 2008. 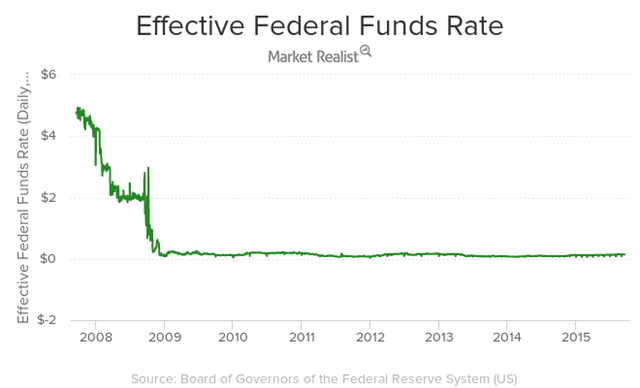 The Fed Funds rate has been at the zero bound for 7 years. In January 2009 I posted a comment on the December 16, 2008 decision by the FOMC after hearing from Laurence Meyer, former Vice Chairman of the Fed. Meyer recommended that the Fed take a long vacation, but I am pretty sure he didn't mean a vacation that would last this long. The average monthly job growth for the three months August-October is about 150,000, well below the 210,000 per month first-half-2015 average. The potential for a rate rise has pumped up the dollar to one-month high against the British pound and a three-month high against the euro. HTML | PDF | RSS | Commissioner's Statement. CityEconomist has decided to give its 2015 Statistical Beaver Award to the U.S. Census Bureau for releasing their 2010-2014 American Community Survey (ACS) 5-year estimates one week early. In the statistical arena, the huge advances that have been made in communications technology have not made much of a dent in the reporting speed of many government statistics. However, lags in release of routine government data make it harder to control access. Some innocent-looking numbers have great value in the private sector to those who get them before the general public. In the case of the many monthly numbers, they are handed on to Federal agencies routinely by each state. State statistical agencies collect data against national standards. As years go by, it stands to reason that delays could be reduced. It is encouraging when statistical agencies voluntarily move up the date of release of their data. In this case, users will have more time to analyze the new information before they leave for their holidays. 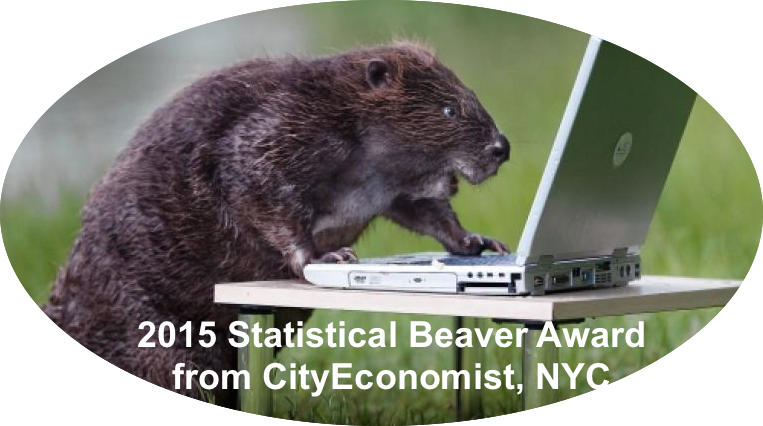 Here is the Census Bureau announcement that gave rise to the CityEconomist Statistical Beaver Award.